September 18 (Sunday from 1 - 4 p.m.) History Walk Training: Radicals & Reformers Cemetery Walk. 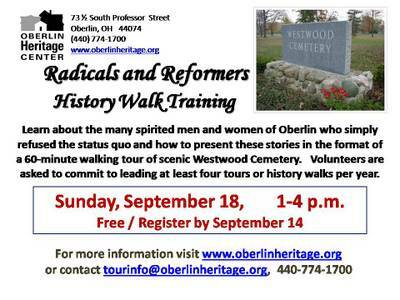 Learn about the many spirited men and women of Oberlin who simply refused the status quo and how to present these stories in the format of a 60-minute walking tour of scenic Westwood Cemetery. Register by September 14. Questions: tourinfo@oberlinheritage.org. We ask that volunteers commit to leading at least four tours or history walks per year. Location: Training begins at the entrance to Westwood Cemetery.